Home Articles WordPress version 2.9 Carmen Released! 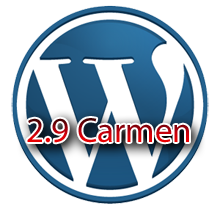 WordPress version 2.9 Carmen Released! Great news today! WordPress development team just announced the immediate availability of WordPress version 2.9. This version is named “Carmen” in honor of magical jazz vocalist Carmen McRae. You can upgrade easily from your Dashboard by going to Tools -> Upgrade, or you can download the ZIP file from WordPress.org. You can also check a short video summarizing some of the cool things about the new version here. 2.Another great addition is the Built-in image editor that allows you to crop, edit, rotate, flip, and scale your images to show them who’s boss. This is the first wave of our many planned media-handling improvements. 3.Easier video embeds that allow you to just paste a URL on its own line and have it magically turn it into the proper embed code, with Oembed support for YouTube, Daily Motion, Blip.tv, Flickr, Hulu, Viddler, Qik, Revision3, Scribd, Google Video, Photobucket, PollDaddy, and WordPress.tv (and more to come in the following releases). 4.Batch plugin update and compatibility checking, which means you can update 10 plugins at once, versus having to do multiple clicks for each one, and we’re using the new compatibility data from the plugins directory to give you a better idea of whether your plugins are compatible with new releases of WordPress. WordPress 2.9 provides the smoothest ride yet because of a number of great improvements under the hood and more subtle improvements you’ll really begin to appreciate once you’ve been around the block a few times. Patagonia Theme and Tandil Theme are both fully compatible with this version. Subscribe to our RSS to be part of our free WordPress hosting with no ads and follow us on Twitter for more blogging articles.